Out of the darkness and into the light, Rowland S. Howard – proclaimed by singer and screenwriter Nick Cave as "Australia's most unique, gifted and uncompromising guitarist" – established a sound and wraithlike image unlike any other. Acclaimed writer of underground anthem Shivers and arguably one of the world's most influential indie guitarists, his innovative fretted fury helped define an entire movement of music, endearing him to the imagination of a generation. Autoluminescent details personal moments with the man, his many musician mates and his long-lasting musical legacy – from the genre bending post-punk creations of seminal 80's group The Birthday Party to the breathtaking edge of the audio abyss in These Immortal Souls, Rowland S. Howard remained an artist foremost and an enigma to the end. Autoluminescent is a detailed charcoal sketch of the man in captivating chiaroscuro, his art and the many ghosts that influenced his world. The film features rare archival footage and exclusive interviews with the likes of Nick Cave, Mick Harvey, Phil Calvert, Lydia Lunch, Henry Rollins, Thurston Moore, Ollie Olsen and Bobby Gillespie. 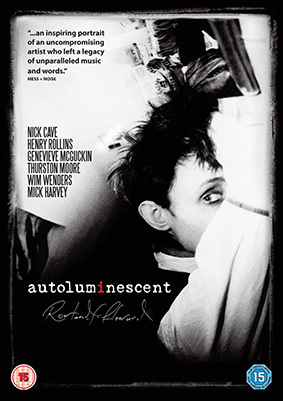 Autoluminescent will be released on UK DVD on 27th January 2014 by Matchbox Films at the RRP of £15.99.